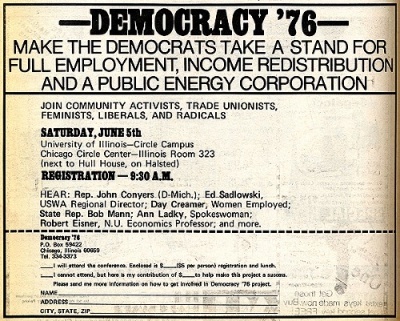 Democratic Socialist Organizing Committee organized a Democracy '76 seminar in Chicago in June 1976. It featured John Conyers, Bob Mann, Ann Ladky, Day Creamer, Ed Sadlowski and Robert Eisner. In 1996 Robert Eisner, Northwestern University was one of the original 130 founders of Campaign for America's Future. This page was last modified on 31 December 2012, at 01:20.